A common belief is that solar panels add pressure to pool pumps, causing damage and premature failure. It simply is not a problem. This is an often-repeated myth perpetuated by pool service companies or dealers that sell traditional heaters (scare tactics). The thought process goes something like this: when using solar panels to heat a pool, you have to lift all of that water up to the roof. And there is a lot of extra plumbing added to the pool system. So this must make the pump work harder and will make it die an early death. Water that is lifted to the roof also needs to come down. That water coming down creates a siphon effect, pulling the water behind it down. The higher the lift, the more the siphon creates a vacuum (negative) pressure, so the height does not matter much. The added pressure from height is negligible. There is definitely extra plumbing involved in a solar pool heating system. However, at the recommended flow rate of about 40 gallons per minute for a typical system, the added pressure from friction in 2 inch PVC plumbing is not much. Some dealers use 1-1/2″ plumbing, which adds about twice as much pressure as 2″ plumbing. Larger plumbing mitigates this and results in a negligible effect on overall pressure. Less pressure (more flow) will increase your solar panel performance, but won’t make your pump last longer. The panels themselves should not add much pressure to the system. Our panels have the lowest resistance to flow in the industry. But even our competitors’ panels will not hurt your pump. They may not work as well, but the pump should be fine. Pool pumps are designed to work continuously along their entire performance curve. That means that as long as water is not nearly stagnant and there is at least some flow, the pump will not be damaged. Overheating is a potential concern, but that only occurs in a state of stagnation, which should not be the case because solar panels do not add much pressure as explained above. Pool pump motors will not “work harder” either. Work (the physics term) is related to movement (displacement). If the pump does less “work” (i.e. moves less water) the motor will not “work” as hard. Pool pump motors operate at 3,450 RPM regardless of the movement of water in the pump. Pump motors die due to internal electrical failure or friction from bad bearings primarily. Heat is normally dissipated fine, but can be an issue if water stagnates due to high pressure. But again, this would not be related to a properly designed and installed solar pool heating system. Solar pool heaters typically add somewhere between 1 PSI and 5 PSI to the pressure side of a pump. 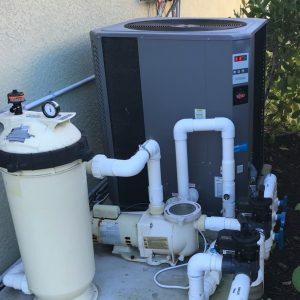 As long as the pump is not over-pressurized already due to a poorly designed pool or service issue, solar pool heating panels will not add enough restriction to cause pump damage. To be clear, a high flow rate is critical to effective solar panel performance. Restriction is reduced by using large diameter plumbing, full-flow solar panel tubes with overmolded headers, quality full port valves, and good installation practices. But your pool pump is not at risk when adding a solar pool heater. The myth is simply not true.